I am a professional dancer turned seamstress and started sewing full time nearly six years ago after I had my son (our mascot Fred!) and now run my own personal successful website & blog and my aim is to show others just how easy , CHEAP and fun social sewing can be! I was lucky enough to be short listed for for the BBC TV programme The Great British Sewing Bee ( first one) and have recently been featured on Made By Rae , Homemaker Magazine , Love quilting , The buddy magazine & many many other publications. 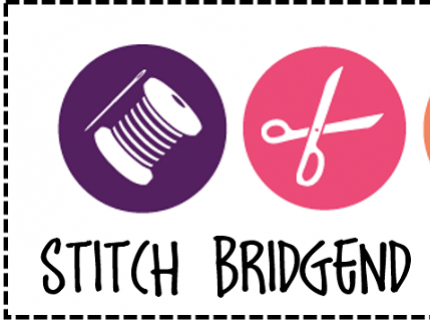 Stitch Bridgend started with one small class of local mums and was based at Bridgend Recreation centre almost 4 years ago and now in 2016 has several weekly classes plus intensive courses with over 876 active students based at Brackla community centre From September 2015 Stitch Bridgend will also have a mobile sewing class unit delivering workshops to local clubs , schools & events. Sewing in 2016 is far from boring, patterns are now available online in PDF form to download instantly and come complete with full tutorials, video sites like YouTube are filled with millions of tutorials and help guides, and TV Programmes such as The great British sewing bee are more than fashionable, throw in some stunning up and coming fabric designers, Oriela Kelly, Michael Miller , Made by Rae , sew Caroline and Cath Kidston and gone are the visions of 70s paisley brown curtains and those school sewn peg bags! The great 'upcycle' movement is growing strong in the UK and the vintage vibe is very fashionable , fabrics are now more accessible and modern machines are far easier to use! My Personal Goal is teach as many people to sew as possible , from all ages and backgrounds to bring everyone together with a common interest at an affordable price. Our classes are based around a whole host of sewing skills whilst making friends and becoming a part of the amazingly supportive and friendly Stitch Bridgend student family.